My name is Victoria Spring. I think you should know that I make up a lot of stuff in my head and then get sad about it. I like to sleep and I like to blog. I am going to die someday. I’m really rather impressed (and a teeny bit jealous) of how good nineteen-year-old Alice Oseman’s writing it. Her age probably helps a lot with the authenticity of voice. Tori is sarcastic teen through and through. But she’s real and likable and starting to realise people around her aren’t all that real themselves. 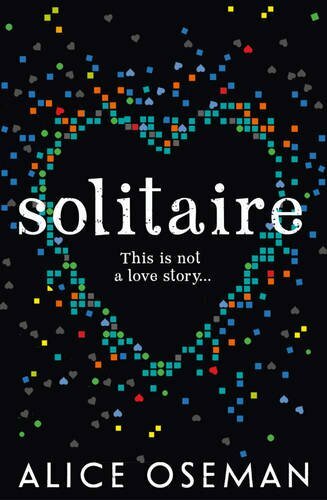 Before I picked it up, I thought the Solitaire in the book might be some masterminded futuristic thing, but it centres on teenage pranks. Some pranks are more annoying, or dangerous, than others and as more people are pulled in, it takes on a life of its own. I hate the phone. It’s the worst invention in the history of the world, because, if you don’t talk, nothing happens. You can’t get by with simply listening and nodding your head in all the right places. You have to talk. You have no option. It takes away my freedom of non-speech. I imagine a lot of actual young adults will find Tori completely relatable. Yet, as a thirty-something reading this, I found myself finding a lot of myself in her too. I definitely agree with her on the phone business, I’ve never found phone conversations easy (though they do get easier with practice). Perhaps it is because Tori is on the cusp of growing up – not in a coming of age style story way. More than she is starting to think more like an adult on some things, starting to see how people really are. There’s a time and a place for being normal. For most people, normal is their default setting. But for some, like you and me, normal is something we have to bring out, like putting on a suit for a posh dinner. Underneath the surface is something a lot deeper. A sense of loneliness that being around people doesn’t cure. A sadness that can’t be pinpointed but is often brushed aside. Especially as teenagers, so often people just expect them to be moody. Tori’s brother’s problems are easy for all to see, suffering from an eating disorder and self-harming. Hers are easier to hide.